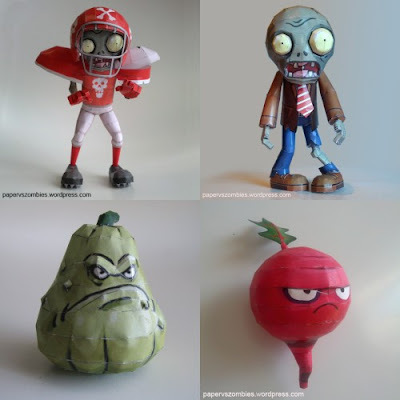 The Paper vs Zombies blog hasn't posted any new Plants vs Zombies paper models since 2014. However, as of today's date, downloads of all their papercraft templates are still available. The models aren't easy to build, but if you are skilled enough to pull them off, the results are fabulous. Each of the paper video game characters was created from scratch using 3DS Max, Pepakura Designer, and Photoshop. If you are interested in building any of the models in this collection, download them now! You never know when they will be gone for good. 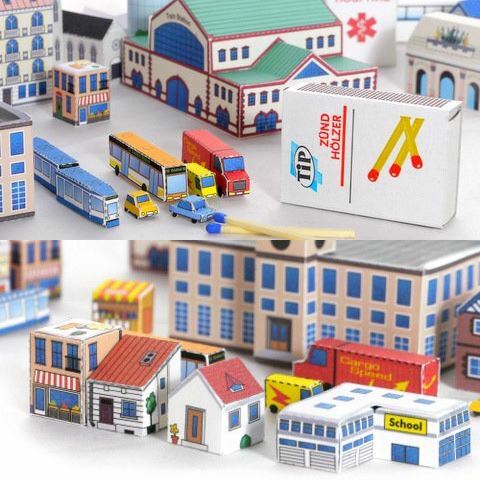 "...models of buildings, vehicles and infrastructure that are at a small scale, so that a whole city will fit on your desk. I kept the models as simple as possible, most being simple blocks, so that despite their scale, they are easy to build." The models shown in the photo are the first set in an ongoing series of paper buildings. 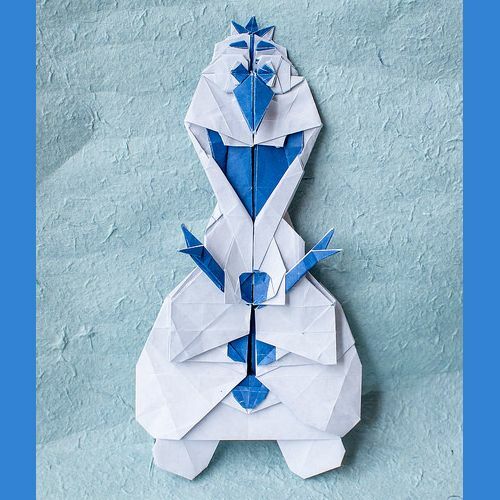 Origami designer Michelle Fung calls this pattern "Happy Snowman", but we all know who it really is: Olaf from Disney's Frozen! ^^ Olaf was folded by Michelle from one uncut square of 20 inch kami paper, blue on one side and white on the other. The crease pattern for this origami is available on Michelle's website. Captain Phasma is one of my favorite characters in Star Wars: The Force Awakens, so I was happy to find this paper model of her helmet. The model comes in two sizes: life size and a scaled down version. 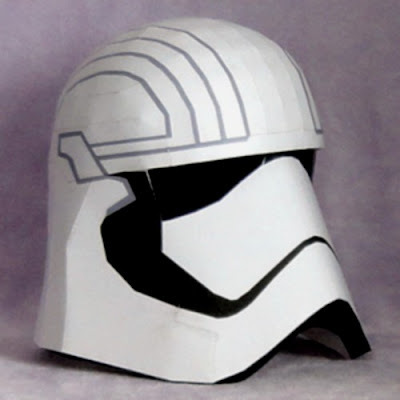 The PDF templates for the helmet may be downloaded here. Captain Phasma is played by actress Gwendoline Christie who also stars in HBO's Game of Thrones as Brienne of Tarth. 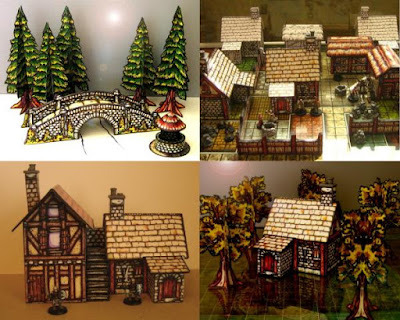 Although this papercraft medieval village called "Inglemere" was created for use in RPG gaming, I can see it also being used during the holiday season as a Christmas village. I really like the bold graphics! Except for the well, all of the components were designed by DeviantART member MadunTwoSwords. The printable templates for the village may be downloaded here. The collection of buildings includes a well, a bridge, a cottage, a tall house, a tower, a barn, fences, coniferous trees, deciduous trees, and even some forest critters. 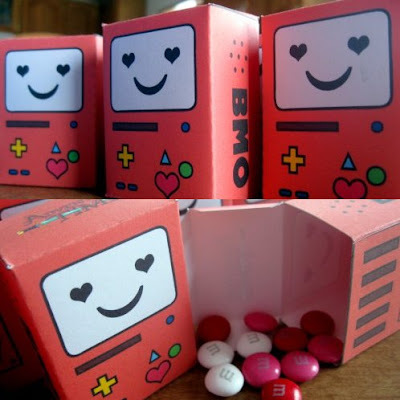 Here's a fun papercraft project to do with your kids on Valentine's Day: A Beemo candy box! The cute living video game console from Adventure Time was given a makeover by the folks at Grungezombie.net to become a video game machine full of love. The PDF file for the box may be downloaded here. Happy Valentine's Day! 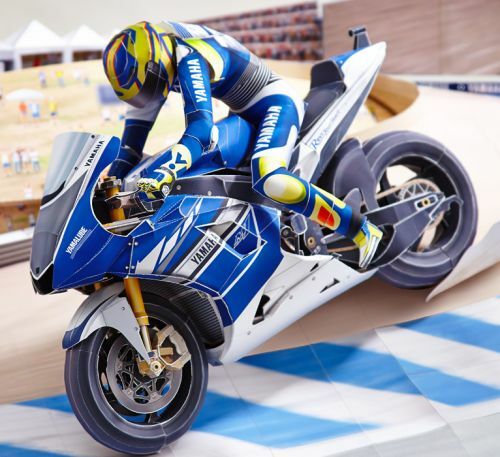 This nicely detailed papercraft motorcycle racing diorama is offered by Yamaha to promote their YZR-M1 motorcycle. The YZR-M1 was developed by Yamaha specifically to compete in the MotoGP World Championship (which is what the diorama depicts). Such a motorcycle is not available for sale to private individuals and is not street legal. The four part PDF template for the diorama may be downloaded here. 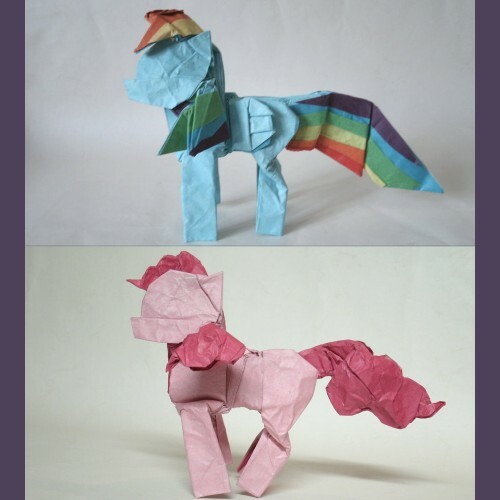 DeviantART member Cyberglass has created a collection of eight origami representations of My Little Pony characters. Pictured are Rainbow Dash and Pinkie Pie. Also included in the collection are Nightmare Moon, Princess Celestia, Twilight Sparkle, Fluttershy, Rarity and Applejack. Photos of all the ponies plus folding instructions may be found here. 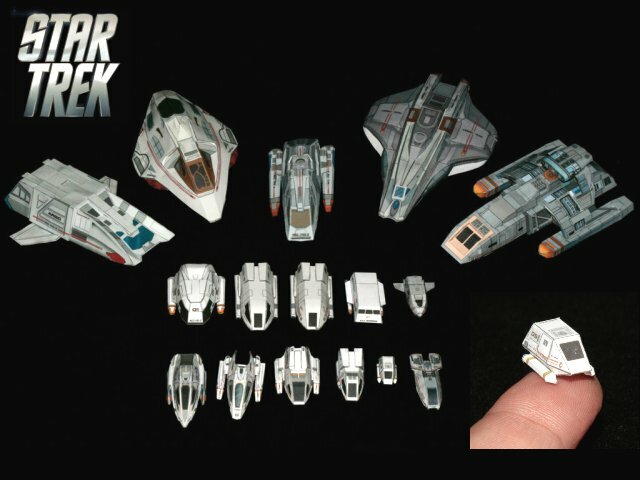 This collection of 1:200 scale Star Trek shuttlecrafts includes sixteen different paper models. The smallest one (as you can see) is no bigger than the tip of your finger. Several different Star Trek TV shows are represented by the models, including the original Star Trek series, The Next Generation, Voyager, and Deep Space 9. A single PDF containing every shuttle pictured may be downloaded here. 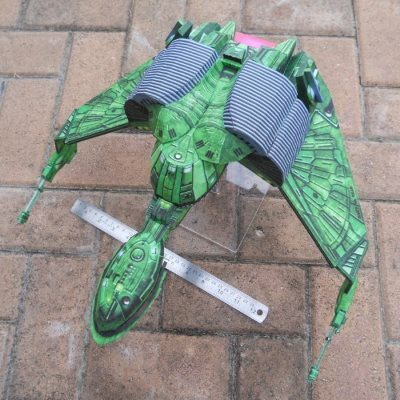 Build photos and paper model designs are by DeviantART member ThunderChildFTC.